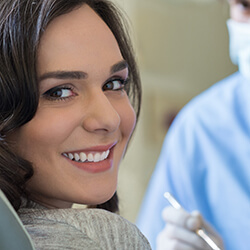 To ensure we are able to offer the most efficient, comfortable dentistry possible, your midtown Atlanta dentist works to stay on top of the latest advances in dental technology. 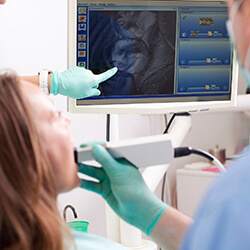 We can now take an advanced, in-depth look at your teeth, gums, and surrounding oral structures using digital x-rays and our intraoral camera. And a helpful tool called the Wand completely changes the way we administer local anesthesia. Keep reading to learn more, then request an appointment at Midcity Dentistry! With our Dexis and NOMAD digital x-ray systems, Dr. Michaels can look more closely below the visible surface of your teeth to catch cavities and other oral problems earlier, which usually allows for more conservative treatment. While traditional x-rays have long been the standard for radiography, going digital offers a number of benefits. 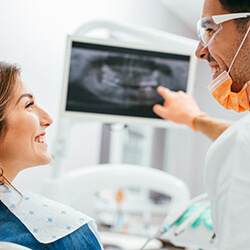 For their improved results and reduced radiation exposure (by as much as 85%), digital x-rays are replacing the traditional system in dental offices across the country. Dr. Michaels and our team are happy to offer this wonderful option to friends and neighbors in and around midtown Atlanta. One of the reasons people dread visiting the dentist is simply because they fear needles. 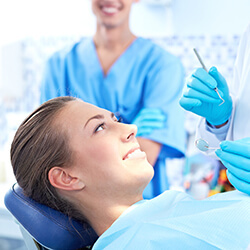 Local anesthesia numbs the jaw so you don’t feel a thing during procedures like fillings, extractions, and root canals, but some people just can’t bear the thought of even getting that first injection. The Wand offers an excellent option for patients of all ages. It is a painless, computer-assisted anesthetic injection system — and it leads to happier patients, easier procedures, and better smiles overall. The first of its kind, the Wand controls the rate at which the anesthesia flows through to the gum, as well as the pressure of the anesthesia during the injection. With three speeds, the Wand flow rate can be changed depending on what type of anesthesia is administered. It’s a small, handheld tool that allows your dentist extreme precision, shortening the total time it takes to administer the anesthesia and greatly improving your experience throughout. A picture is indeed worth a thousand words, and it is much easier to communicate important information about your oral health through images rather than trying to explain what’s going on in your mouth. With our IRIS HD USB 3.0 intraoral camera, we can bring the smallest details into sharp focus, and then put them on a screen located right at your chair side. The IRIS HD is a portable handheld tool tipped with a camera, and it is one of the best on the market. We are pleased to offer this advanced technology to patients at Midcity Dentistry.